← 6 more months of dumb. Yes, yes I know. It’s not even Thanksgiving and I’m blogging about Christmas. I’m just as bad as the stores, radio stations, and everything else people complain about who have nothing better to complain about. I broke down and bought it. The infamous Elf on the Shelf. If you haven’t heard of it, you’re either childless or live under a rock sans society’s Christmas-tradition-must-have pressures. If the rock is your gig, can I join you? Please? I’m super tidy, especially being pregnant. That earthworm infestation problem will be gone in no time and I’ll have your dirt neatly packed on the daily. Mull it over and let me know. My house is becoming too chaotic. Anyway. The Elf on a Shelf is a little elf doll that you hide each morning before your child wakes up so he or she can then go on a hunt for it. The innocent child truly believes the elf’s real because it won’t sit in one place for longer than 24 hours at a time. Obviously. Duh. Or something like that. 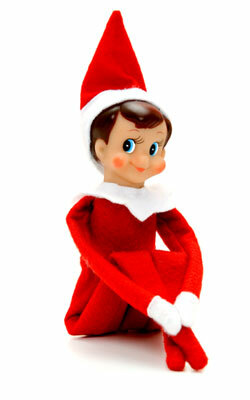 The elf’s deal is that he travels back to Santa each night to report on the child’s behavior. That’s why he’s in a different room each morning. That and he’s got location-based ADD. No, no. You know, it’s the whole naughty or nice spiel. He’s Santa’s messenger. But he lives with us. Sort of like a magical foster child situation. So, yes. I begrudgingly coughed up the $29.99, the original manufacturer’s suggested retail price, or MSRP for those of you who live for acronyms, after searching high and low for discounted elves. I did it all with high, high hopes. Maybe, just maybe my nearing-terrible-twos child might actually listen to and obey his desperate, strung-out parents in the name of the all-seeing, Santa-tattling elf. We’ll see, to be determined (TBD). To be blogged (TBB). One cute anecdote has unfolded already since the recent arrival of our new foster elf. Not really. That’s what my brain said to itself. Yes, I hear voices. Thought you knew that going into this. Keep in mind, this dear child of mine has never named anything. ANYTHING. He’s got “Mama” and “Dada” and “Ya-ya” and “Bapa” (Gramma and Grampa) down pat and that’s it for names. His favorite stuffed animal monkeys that he dotes on day and night? No names. Just “Mama” for the big one, spoken in a gruff, masculine, truck-driver, borderline-exorcist voice and “Beebee” for the little one, spoken in a soft, sweet tone. So needless to say, I was totally taken aback. Shocked. Shocked to the bone with warm and fuzzy, my-son-is-brilliant-and-maybe-more-verbal-than-I-give-him-credit-for feelings, that is. So. I guess one good thing has come from giving in and buying the rip-off elf so far. I’ll keep a tally and let you know any other funny-good ones. Until then, Merry pre-Christmas, friends. He looks so sweet. So innocent. I don’t know. The jury’s out still. This entry was posted in Uncategorized and tagged Elf on the Shelf, naughty or nice, stay at home mom christmas, terrible twos. Bookmark the permalink. 1 Response to I bought an elf. I have two observations regarding the Elf story: 1) If you had just waited a couple weeks before buying the elf you probably could have found at least one in a snow bush within throwing distance of a frustrated parent’s front door. See what happens is, you first time parents actually believe your child will behave better under the threat of the watchful eyes of this all-seeing, tattle-taling elf. After a week of not seeing any improvement in behavior and fighting with your spouse over whose turn it is to hide the damned elf, one or both parents is going to make a very dramatic (and traumatic for the child) display of throwing the elf out the front door. 2) Do you think “Bobbie” could be whoever that is that you sometimes hear Kellan talking to in the middle of the night, maybe Kellan’s “Ghost on the Bedpost”?